Announced last June, original Amazon Fire Phone represented a rather monumental step for the massive online retailer. Amazon already had its existing library of e-readers and tablets, but here was their first smartphone. Instead of competing on spec, the Fire Phone offered some unique features like Dynamic Perspective and Firefly. Sadly, by just about all accounts, it has been a flop. The price got slashed to $199 unlocked just a few short months later and just about no one cares about this phone anymore. And while you may be inclined to think that Amazon would learn its lesson and focus on its strengths elsewhere, it looks like a second-generation Fire Phone is in the works and Amazon wants your feedback. 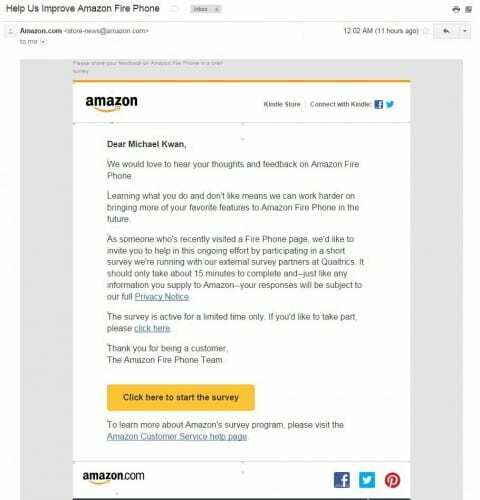 Skimming through the mountains of spam important e-mails I receive each day, I came across an invitation to participate in a survey about the Fire Phone. More importantly, they also ask about how they can bring “more of your favorite features to Amazon Fire Phone in the future.” That sounds like a new Fire Phone is coming to me, don’t you think? Of course, this could just be Amazon kicking a few tires to test interest in a next-generation Fire Phone and an actual device may never see the light of day. Many of the Android phone folks are struggling to be profitable, BlackBerry has clearly seen brighter days and Microsoft cutting back on Windows Phone. Should Amazon really try to get back into the battle arena with its own Fire OS-powered smartphone again?